I read to my class every day after morning and lunch recesses. However, I may sometimes need to take care of something that occured at recess or set-up for our next learning activity. 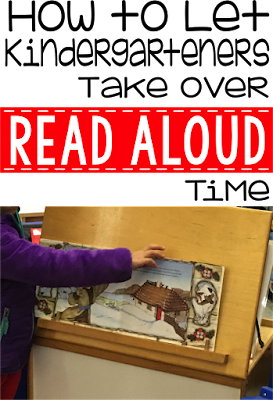 This makes reading aloud impossible and expecting students to sit quietly on the carpet waiting isn't an option. I have turned this time into a student spotlight moment. My students LOVE to be the "Guest Book Presenter" for the read aloud. I have a ton of books on tapes and CD's and a big book easel. I started with the most capable students first. The ones I knew who could turn the pages at the audible page turning sounds. While the story is playing, the Guest Book Presenter turns the pages when prompted. This gives me the time I need to take care of whatever it is I need to deal with and it gives my students an opportunity to be in the spotlight. It is a win-win! On a side note you may be wondering well, where do I get all of these books on (tapes/CD) yes, I wrote tapes. I've been teaching and collecting for a while. I also try to buy them each month from scholastic book orders with my bonus points. Scholastic book clubs is the easiest and the least expensive way I have found to order the books and CD. I especially like it when they bundle the 4 books and CD's together. Below is just a few of the books we will be using in the next few weeks These books can be found on Amazon and come with CD's. The following section contains affiliate links, which means if you click on one of the product links, to purchase the product or any other products from this website, I'll receive a commission. I encourage you to give it a try. If you already use a listening center in your classroom, then your students should know how to turn the pages when they hear the page turning sounds. Just tell them you will be selecting the Guest Book Presenter based on their listening skills. That should help to keep them quiet.